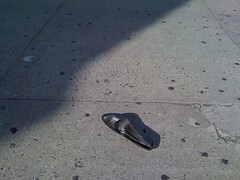 New York City Metblogs » Did anyone lose a shoe? Did anyone lose a shoe? Sunday afternoon stroll. Someone lost a heel in the middle of the sidewalk. I love New York City!